With mounting cost and consolidation pressures, community hospitals need a new approach for handling the challenges of today’s health care environment. It is possible to remain independent—and thrive—as a community hospital. Here’s the key: community hospitals have a deep familiarity and long history with the communities they serve. 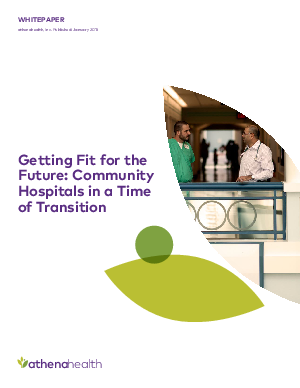 By leveraging this advantage, as well as strengthening strategic partnerships and building patient and provider loyalty, community hospitals can position themselves at the center of a care system that provides essential, sought-after services. 1. Get control over your financials. 4. Improve provider loyalty and alignment. 5. Adjust to changing reimbursement models.